We’ve all seen the glorious photos of expansive Dutch flower fields in the spring, carpets of colorful blooms which you can even see from the airplane as you land in Amsterdam. But is it really as awesome as the pictures? The answer is NO. It is about ten times better than the pictures! Fields of bright tulips of every shade, violet curly clouds of intoxicating hyacinth, butter-yellow seas of swaying daffodils, all interspersed with windmills, horses, sheep, geese, friendly dogs of every breed, and even an occasional cat sneaking through the high green polder grass. It was, without exaggeration, one of the most beautiful and magical days of my entire life. 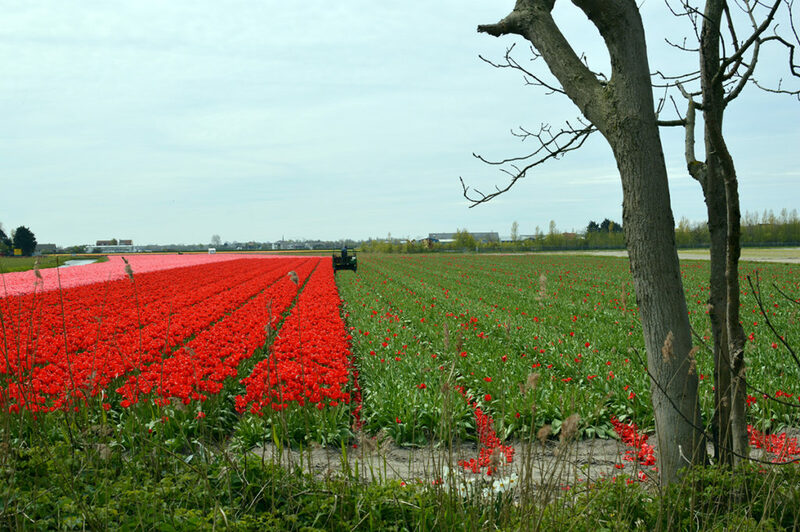 Unfortunately, when you arrive in the Netherlands, usually in Amsterdam, your main access point for viewing tulips seems to be the Keukenhof gardens – a huge formal park that serves as a showcase for the country’s best bulb producers and landscape designers. Once there, you can rent bicycles to view the fields around the park, but… where are the regular fields? And how can you get there? Where do you get a bike for that? Actually, these are all good questions. 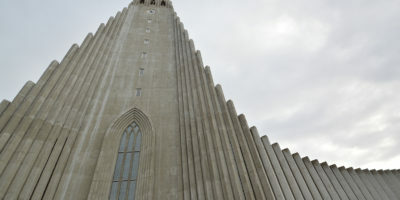 It’s not totally obvious, and it’s not as ready-made as you would expect for a tourist attraction so famous. However, it is possible to do on your own. 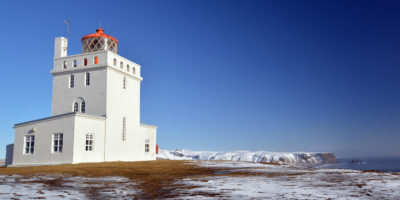 It’s not very expensive, and it’s surprisingly devoid of tourists. Here are the steps you need to take to have your own multi-sensory flower adventure. Although nature is unpredictable, the most reliable time to see tulips in bloom is in the last week of April and the first week of May. On top of prime tulip time, April 27th is King’s Day, which is a fantastic city-wide party in Amsterdam. It is high tourist season, but it’s worth it. Give yourself time. Don’t come to the Netherlands for 3 nights and expect everything to be perfect. Spring in South Holland can have warm sunshine, or it can have freezing rain. Whether or not the flowers are in bloom, you will not want to spend a rainy day biking. If you can, plan your tulip trip for non-holiday week days, rather than the weekend. 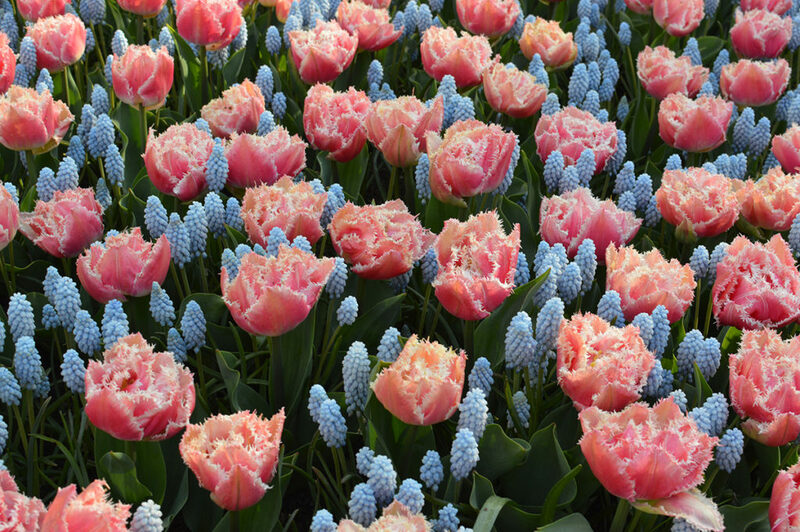 The optimal base for tulip viewing is Leiden, an old university town outside of Amsterdam. If you plan well in advance, you can find some very affordable options right in the town center – after all, this isn’t Amsterdam! You should book at least two nights here, but actually three is better. If the weather report is not good on one day, you will have an extra day for your adventure. 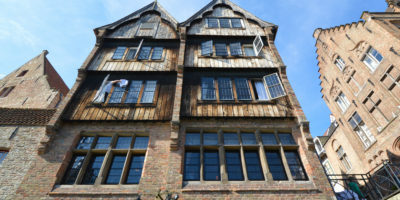 There is plenty to see in Leiden. 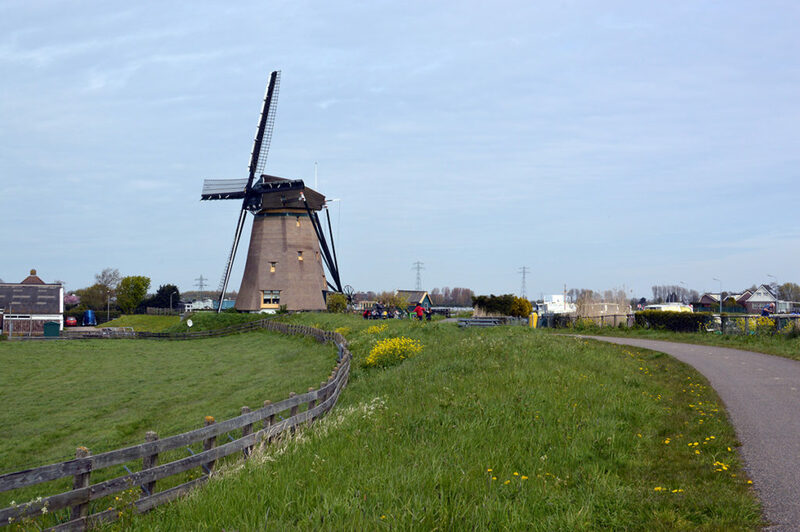 It’s well connected to the rest of Holland, has many restaurants and some good museums of its own. It also has all the stores you need to get ready for your trip. Arrive by noon to make the necessary arrangements. Rent your bikes the day before your trip, and keep in mind, like most things in the Netherlands, the bike shop closes at 5:30 p.m. and is closed on Sunday. And it doesn’t open until 9 a.m. A good place to get a bike is Euro Tweewielers on Breestraat. The shop sells, rents, and fixes bikes as well, and they will adjust the seats and handlebars for you and let you try it out until you are happy. The rental bikes are in very good condition and have two types of locks on them. You should have plenty of cash to leave a deposit, about 40 euros per bicycle. After you rent your bikes, head up Breestraat to an outdoor equipment store called Bever, the Dutch version of REI. And yes, Bever means what you think it means. 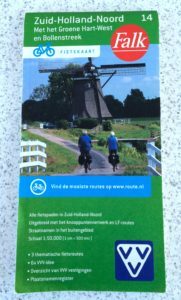 On the upper floor, near the windows, you will find a rack of cycling maps covering every part of the Netherlands. 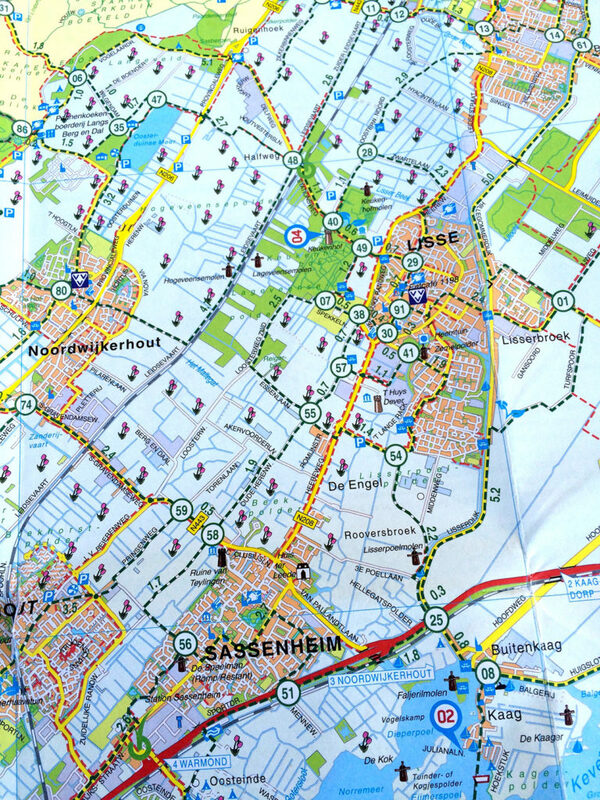 You need a map #14 called Zuid-Holland-Noord, or South Holland – North, which encompasses The Hague, Leiden, and the tulip field area. Open it up, double check. Ask an employee for help – they will explain how to use the map on the road and recommend a route. In a nut shell, there is a network of bike paths connecting all of Netherlands which is marked with green dash lines and green junction numbers. You plan your route based on junctions, and at every junction you will find a green circle with the number and the direction of the next junctions. For example, junction 55 is a cross roads and will have arrows towards junction 07 to the left, junction 54 to the right, and junction 57 straight ahead. The cycling maps are great, but not every junction will be marked perfectly, you can miss a number, and things sometimes get confusing within towns. You should definitely have an unlocked smartphone with a local data sim card to allow you to check your location on the GPS. It will save you a lot of time and pedaling. On the day of the trip, time will be precious. And when you’ve come all this way to look at flowers and windmills, you don’t want to waste your lunch on a restaurant – you want to have a picnic! Leiden has bakeries and grocery stores where you can get everything you need. Prepare your lunch the night before and plan to have a quick breakfast at home before departing in the morning. Unlike Amsterdam, Leiden’s coffee shops serve mostly locals and have regulated operating hours of 5 p.m. to 11 p.m. If you want to enjoy some legal ganja while viewing the flowers, make sure you get it the night before. A well regarded shop is Bebop, where you can get a recommendation from the owner. 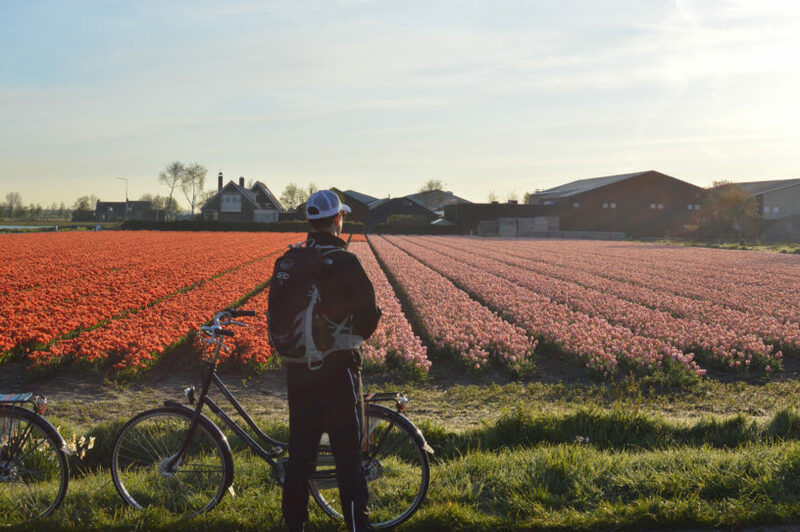 Yes, your day of cycling in tulip land should include a visit to the famous Keukenhof. To avoid wasting time the next morning, buy tickets online. If you’ve done any cycling, you know that you can get hot very quickly and need to be able to cool down while still maintaining wind protection. Weather can be very changeable, so you need to be able to bike in a windy 45 degrees as well as in a sunny 70 degrees and to keep warm when stopped. Bring a hat, gloves, a rain jacket, a warm layer, and a light layer. I definitely had to take things off and put them back on several times throughout the day. I followed an itinerary that accomplished two important things – to arrive at Keukenhof before it opens and be one of the first people in the park, and to return to Leiden in time to return my rental bike before 5:30 p.m. For this, you need to leave Leiden at 5:30 a.m. That’s right, it is early. But it will be the most worthwhile early morning of your life. Get up at five, have your instant coffee and energy bar, and get on the road. Sure, Keukenhof may be “one hour away on bike” according to Dutch people, but for a traveler following the bike trails for the first time and hoping to take some pictures on the way, at least two hours should be allowed. Also, the photos you take at 6:30 a.m. will have amazing light. Arrive at Keukenhof before 8 a.m., lock up your bike to the wooden rack near the parking lot, get into the admission line. 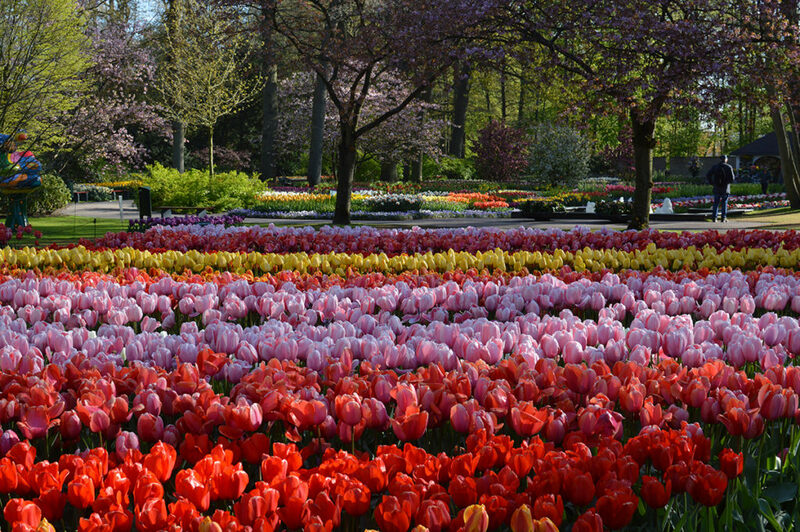 8:00 a.m. – Keukenhof opens and you can enjoy it for an hour with almost nobody around! By 11 a.m. the park will be full of people, and you can think about leaving. 11:30 a.m. – Make your way back to junction 55, head towards junction 54, then 25; pick a spot to have your picnic. There are both flower fields and a windmill in the area. Please remember that flower fields are working farms and stay on the edge of a field. If it is protected by canals, don’t attempt to cross to get closer. Your shoes can introduce harmful bacteria, and farmers aren’t going to be happy about that. 1 p.m. – Although it is not fully open in spring time, you can make a detour to Kaag and take the world’s shortest ferry ride to this tiny island. Here you can have another snack and coffee on the deck of the Kompas restaurant with a view of the lakes and sail boats (try a pannekoek – giant crêpe!). If the south ferry is operating, you can take it, and this will shorten your trip to Leiden via junction 39. If not, you will have to return via the north ferry and go to junction 51 to get home. The ferry driver will inform you of this, and you won’t have to pay anything to come back. This is just one option for the itinerary. With the map in your hands, you can choose a different path and see more fields north of Keukenhof, or head west towards the beach and come back via Noordwijk. If you don’t need to leave early the next morning, you don’t have to return by 5:30. Just keep the sunset time in mind and plan to get back into town before dark. This is a bike path that lies along a polder – a field below the sea level out of which water is drained with a system of dykes. An Italian family chose this scenic spot for their lunch.